Electro-static discharge mats are designed to protect workers from deadly shocks generated from high voltage equipment. 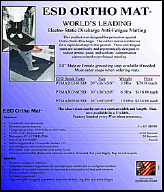 In addition to protecting workers, the ESD mat also protects sensitive & expensive equipment from electrical transfer. This product was designed for protection against Electro-Static Discharge. The rubber mat is conductive for a rapid discharge to the ground. 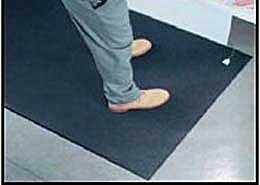 These anti-fatigue mats are scientifically and ergonomically designed to reduce strains, pains, and workers’ compensation claims related to prolonged standing. Self extinguished in 10 seconds, burned 1/4”…….……………………….……..